Friendly advice about video conferencing services you could use at your church. Information provided by the Media Center in the Mission Vitality Office at the United Methodist Rio Texas Annual Conference. The Rio Texas Annual Conference covers a lot of miles. Working together as a conference can be difficult when some of our people need to travel hundreds of miles for a meeting. While we affirm the power and importance of being physically present to one another, we also affirm our need to stay connected even when miles separate us. Below are some inexpensive options for getting started with video conferencing. If you have more questions or need help getting started, feel free to contact us. The Rio Texas Conference is currently using zoom as our main platform for video conferencing. Zoom is a cloud-based video conferencing platform used by over 140,000 companies. Accounts are free unless you upgrade to a pro account. The only serious limitation of the free account is the length of meetings. Free accounts are limited to 40 minutes. However, Zoom has some very powerful features. Our favorite is dynamic voice detection which automatically figures out who is speaking, raises their volume and puts their image on the screen. It is very helpful for larger meetings. The screen sharing feature is also very easy to use and allow you and the group to look at documents, files, images, PowerPoint presentations, etc. While free for basic users, Zoom also offers pro, business and enterprise accounts which removes the 40-minute limit and add additional features. We recommend Zoom to churches since it is the platform used by the conference. However, there are other free and inexpensive options out there. This is an amazing little camera for the price ($99 retail, currently $68.38 on Amazon.) It offers 1080p, H.264 encoding and Zeiss optics. For non-techies, that means that the image looks really nice. It doesn’t have the mechanical remote pan, tilt, and zoom of more expensive cameras but Logitech’s software allows for digital pan, tilt and zoom (if you are on a PC – on Macs, you have to use third-party software.) The viewing angle is excellent so you can get everyone in the shot, it works well in a variety of lighting conditions, and it has built-in autofocus. The camera has a neat mount that works if you are setting it on a table, hanging it from a monitor or attaching it to a tripod. It even has a built-in microphone which may work fine for smaller groups and smaller rooms. One of the problems with setting up video conferencing in existing conference rooms and offices is wiring. The camera is usually easy because it is usually near the display and therefore the computer. You can just plug it in. However, it is desirable to have microphones as close as possible to the participants. This usually means long, ugly cables that people trip over. Bluetooth solves that problem. This little device will pair with any computer (or mobile device) with Bluetooth. If you are using a computer without Bluetooth, you can buy USB adapters for about five bucks. (You can also plug it in via USB.) Once the speaker is paired, it offers loud and clear sound and the microphones inside can pick up voices from every side. It is best suited for offices and smaller conference rooms. However, we are currently using one on our large meeting rooms. 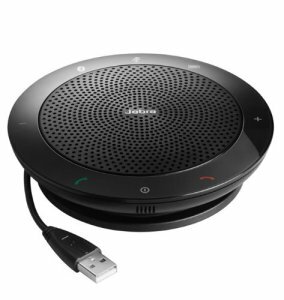 It can be a little hard for users on the other end to hear people at the far end of the room but for $149.00 retail and no installation costs, this little circle is amazing. Zoom’s meeting client is a very small program. They list the system requirements at any 1 Ghz single core processor or better. That is true, but you might want to have something a little better than that, especially if you are one to run other programs at the same time and be able to use all the features. However, you don’t need to go out and buy a top-of-the line PC or Mac to make it work. At the conference office, we run it on PCs because that is what we have and we have a lot of demand for Excel and Powerpoint. If I were starting from scratch, I would be really tempted to run on a Mac Mini. You just need something with a couple of USB ports, a display output, and a way to connect to the internet. Three of the conference rooms we use have large, flat screen TVs. The fourth has a ceiling mounted projector. What you use really depends on your budget and the size of the room. We have seen setups where a laptop’s screen is the display. I have also been in conference rooms where a 32″ TV sits right on the conference table. The only thing that is essential is that you have a way to hook the computer up to the monitor. Some TVs have VGA connections. Newer models might be limited to HDMI. The good news is that there are adapters for just about everything now. Honestly, you don’t need to spend much money at all to get started with video conferencing. You can use Zoom for free and use it on your laptop, smartphone or tablet. There are also plenty of other services out there: Skype, Facetime, Google Hangouts. The only reason to invest more is to get more buy-in. Some people like living on the bleeding edge of technology. They don’t mind fiddling with the equipment and don’t get frazzled if the meeting disconnects. Others prefer to work in a more consistent environment. There are also some situations that require everything to work, work well and work the first time. Some minor equipment upgrades can create a better experience for everyone. For more on video conferencing, check out Pastor Will's blog post. Video Conferencing and Pastoral Care. Click here for help with Zoom!